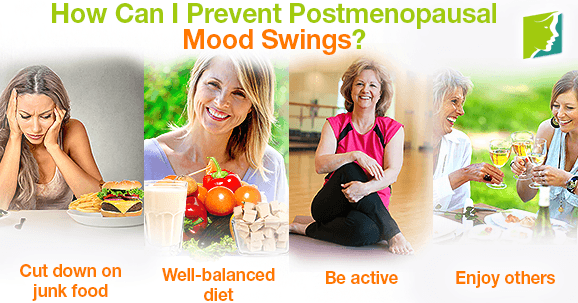 How Can I Prevent Postmenopausal Mood Swings? Mood swings are extremely common for women in general. Whether during PMS, perimenopause, or menopause, the symptoms of erratic emotional states come on strong. Although you may think after menopause you should be free of this exhausting series of feelings, mood swings sometimes persist beyond menopause - even into a woman's 70s - due to low estrogen levels postmenopause. It is important to understand that they can be intensified by lifestyle choices, which can be easily and effectively corrected by adding and subtracting just a few key components. Whether it is processed cookies, crackers, or chips, freshly baked desserts, ice cream, French fries, or some other indulgence, put it aside for now. The fats can make you sluggish and irritable, and the sugars can cause mood swings. If you feel hungry between meals, try a piece of fresh fruit. The less you have the processed stuff, the more delightful the fruit will become. Bananas and mangoes can be a delicious place to start. For savory, a handful of nuts will satisfy hunger and keep your mood elevated. Junk aside, take a look at your daily meals. If they are lacking color and variety, you may not be getting all of the nutrients you need. If you are deficient in vitamins B, C, or D, you will likely notice yourself more unstable emotionally. Have a variety of whole grains, fortified cereals and milks, fruits, vegetables, nuts, and lean proteins (such as tofu or salmon). Once your nutrient levels are restored, you will feel better. You become more sensitive to nutrient deficiency as you get older. When you lead a sedentary lifestyle, you are more prone to mood swings. Sitting around often lets your worries and concerns multiply, making you sad and irritable. You will not know how to fill your time, and may choose things that don't help. When you get up and move around through cardio, happy, and calming neurotransmitters like serotonin and dopamine increase. Brisk walks in the park or on the beach are perfect. If you would prefer something gentle, a yoga session will increase gamma-aminobutyric acid (GABA) - a calming neurotransmitter - and reduce anxiety. Instead of crying or feeling angry all the time, change your lifestyle and add some energy to your life. When you spend time with others, you will feel more supported. You can talk to others about what you are going through so that they understand the hormonal changes during postmenopause. This interaction actually releases oxytocin in the brain, which is a neurotransmitter responsible for feelings of friendship and loyalty. Without social time, you may start to feel isolated and depressed. Next time your mood is getting in the way of your routine and relationships, look to some of your lifestyle choices and see if that might be playing a role. Your physical well-being is directly connected to your emotional state. When you are active and get enough nutrients physically, your mindset follows. You never have to be alone, and should seek support from your closest friends and family.